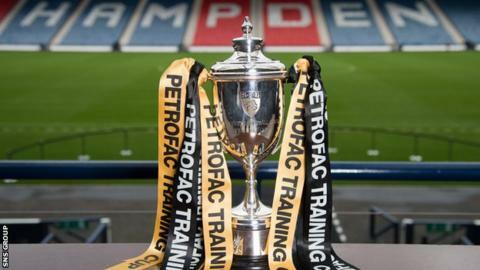 Hampden Park will stage the Petrofac Training Cup final between Rangers and Peterhead on Sunday 10 April. The game will be broadcast live on BBC ALBA, with a 15:00 BST kick-off. It is the first time the national stadium has been used as neutral venue for the Challenge Cup tournament, which began in 1990-91. League One Peterhead will be competing in their maiden senior final, while Championship leaders Rangers were runners-up in 2013-14. Most adult tickets will be £20, concessions are available for £10 and under-16 tickets cost £5. Peterhead have already won at Hampden along the way, beating residents Queen's Park in the semi-final. Rangers eased into the final with a 4-0 defeat of St Mirren at Ibrox.